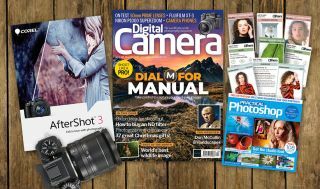 Teach yourself how to shoot like a pro by using manual settings, in the new issue of Digital Camera magazine – on sale now. Exploring exposure, focusing and white balance over-rides, we suggest some strategies for taking control in situations when you can't count on your camera to get it right. Also in this issue, we join family portraiture specialist Catherine O’Donnell on an autumnal location shoot in Bedfordshire, while Sir Don McCullin looks back over his astonishing photography career in a seven-page interview that features some images from his new book, The Landscape. Projects in this issue’s Photo Active section include how to photograph classic cars, and shooting a seascape at night. Discover how to get started in astrophotography, with the first part of a new series by Jamie Carter. Practical Photoshop is Digital Camera’s regular guide to getting the most from the industry standard image editing program. Highlights this month include reducing noise in your pictures, learning to love the Levels function, and getting creative with Curves. Looking to buy some new camera gear? Find out why the Fujifilm XT-3 is such a fantastic upgrade on the previous model and which will be the most nifty fifty for your particular camera system – eight top 50mm primes go head-to-head. There's a guide to buying your first ND filter, plus mini-tests of hotshoe mics and camera phones. Finally, why not purchase the photographer in your life – or even yourself – a tempting treat from our five-page Christmas gift guide? From under £50 up to £500, there’s something to suit all budgets. Finally, don’t forget that every issue of Digital Camera comes in a bag packed with amazing gifts. This issue's headline offering is a free copy of Corel AfterShot 3 image manipulation software – worth £54.99/$39.99 – for Windows users only. Plus there are nine all-new tips cards, covering setups for portrait and manual mode photography. On the included video disc, you can watch 76 minutes of video tutorials linked to this issue’s Practical Photoshop section, choose from 108 studio backdrops to add to your images in Photoshop, and browse our reviews and tests in the 164-page Camera Shopper PDF ebook. The issue comes with a whopping 13 free gifts, too.